Company provides Bulk SMS Marketing Software for GSM Mobile Phones with facility to send mass sms from PC to group of mobile phone numbers. So if you are using major GSM technology based mobile phone, mobile sms software will be real benefit for you. High quality pc to mobile sms software for GSM phone sends instant mobile text message (a.k.a. mobile text sms) without any external help required. 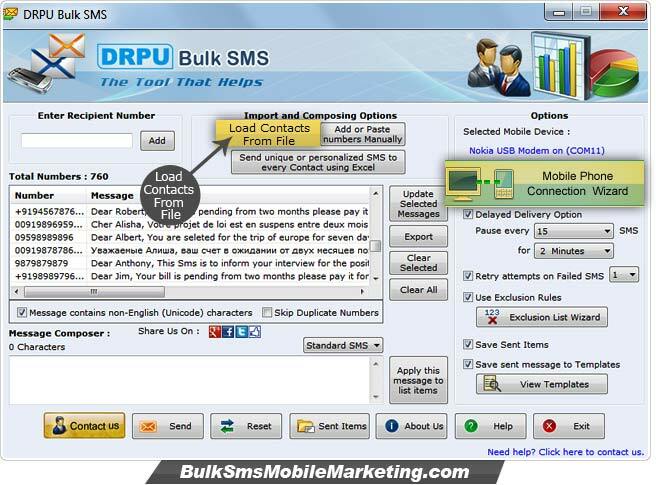 Bulk sms software for mobile phone sends bulk sms without use of any external mobile messaging device or internet connection. Just install bulk text software for GSM phone to send sms mobile messages in English and other Unicode supported languages. Software for bulk sms provides real time benefits when need to send instant messages including mobile marketing messages, Invitation messages, Mobile alerts and other similar type of messages. No internet connection required to send sms using bulk sms software. Option to send sms in Unicode character supported languages. Compatible with major GSM technology based mobile phones. Save sent messages as templates for future reference. Advance option to send notification or standard SMS. Delayed delivery option to manage the load of sending sms.